Should we use an age-adjusted value for D-dimer in patients >50 presenting with SOB, chest pain with normal ECG and CXR and with low-intermediate probability of PE ? ** In 200 of patients <75 yo, 157 had D-dimer between 500 and age cutoff value and 43 had D-dimer <500. 5 patients were excluded later but no mention on which group they were from. There is low prevalence of PE in the population studied (19%). Predictive values in this study may not be applicable in your setting. Unfortunately, no sens, spec or likelihood ratio is provided. Actually, only 337 of patients had D-dimer value between 500-age adjusted value. No control group in this study. The outcome was adjudicated, not confirmed by CTPA. Similarly the cause of death is adjudicated, not confirmed by biopsy. 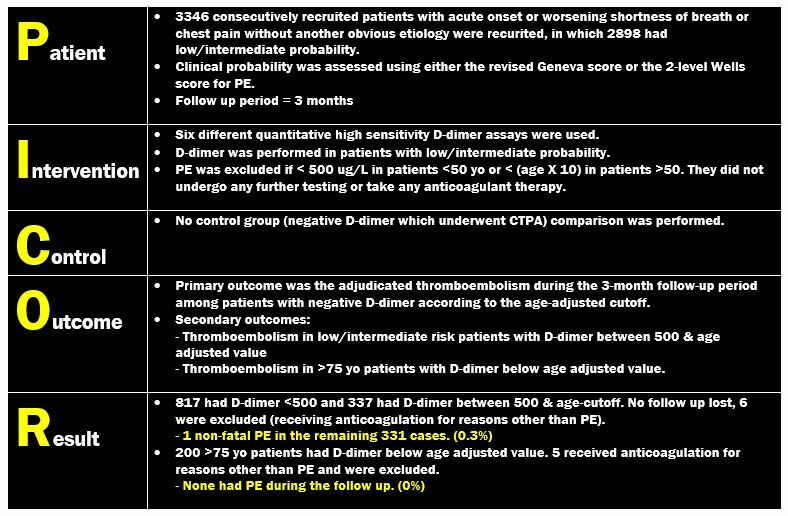 Most of the elderly patients will get CTPA regardless of D-dimer because they are often at higher risk (immobilization, DVT history, CHF etc). So this study may not change the way you are practising right now. Pediculosis and scabies. A revision. Steroids and Vasopressin in Cardiac Arrest?